A BTE hearing aid is exactly what it sounds like; the hearing aid fits over and behind the ear and sound is directed into the ear canal by a thin piece of clear tubing or a wired receiver tube. Some BTE hearing aids use custom ear molds to anchor the hearing aid in the ear and prevent sound from leaking back out and causing feedback while others use a more open fitting to take advantage of good residual low-frequency hearing. A traditional BTE has all of the technology in the casing that fits behind the ear. A Receiver-in-the- Canal (RIC) or Receiver-in-the-Ear (RITE) splits the technology with the hearing aid receiver being housed in the portion of the hearing aid that fits into the ear and the other portion is housed in the casing behind the ear. RIC and RITE products are cosmetically attractive because the receiver tubing is very thin and the portion in the ear is often seated deep enough as not to be visible upon casual inspection. BTEs tend to be more comfortable than the other styles, can fit hearing loss ranging from mild to profound levels, and come in a variety of color options to allow them to blend in or be wild and fun. 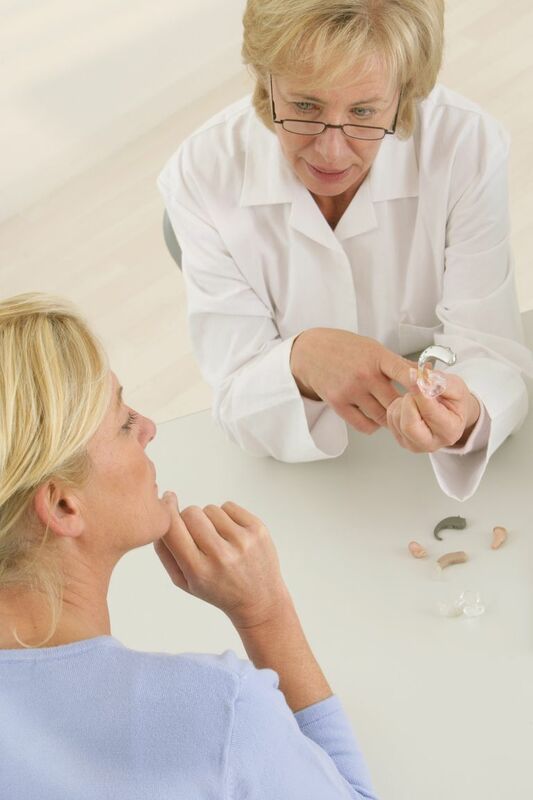 ITE hearing aids are divided into different subtypes depending on the size of the shell. A full shell fills up the entire ear while a half-shell (HS) fills up about half of the ear. An In-the-Canal (ITC) mainly fills up the ear canal with the faceplate taking up about a quarter of the ear. A Completely-in-the-Canal (CIC) is a deeper fitting device with only a small amount visible in the ear. Invisible-in-the-Canal (IIC) hearing aids fit very deep in the ear canal and are virtually invisible when inserted properly. All ITE hearing aids are custom made to fit your ear and accommodate a wide variety of hearing loss configurations. The larger ITE hearing aids have larger batteries so they do not have to be replaced as often and are often easier to handle when there are dexterity issues. The smaller hearing aids, such as CIC and IIC use very tiny batteries so they need to be changed more often. In some cases, people report feeling "plugged up" or that their own voice sounds like they are "talking in a barrel" due to the occlusion effect. Ear wax and moisture issues require more attention in these hearing aids. The Lyric hearing aid is manufactured by Phonak and allows the user to wear their hearing aids around the clock for up to four months. At that time, they need to be removed and replaced in the audiologist's office. The very deep fit of this device allows for better sound quality, less wind noise, and better ability to tell where sounds are coming from, but not everyone is a candidate. Ears must be large and healthy enough to accommodate the Lyric. Most people who can not use Lyric successfully have issues with the device being uncomfortable as it sits near the bony portion of the ear canal. This type of hearing aid works by sending sound vibrations through the bones of the skull to stimulate the inner ear structures. By stimulating the inner ear in this way, outer and middle ear issues causing hearing loss are bypassed. Bone conduction hearing aids are used for conductive hearing loss. In younger children (under age 5 years), bone conduction hearing aids are used with a soft band to hold the device against the skin. In older children and adults, a surgical procedure is completed to implant part of the device. An external processor is still required.